Despite massive, worldwide protest, Ethel and Julius Rosenberg were executed on June 19, 1953, at Sing Sing Prison in Ossining, NY, after being convicted of Conspiracy to Commit Espionage in one of the most hotly-debated trials in U.S. history. Read Robert Meeropol's blog ("Surprise Ending," 10/07/10) for information on Final Verdict, a new book by Walter and Miriam Schneir publishing Oct 12, 2010, which unveils a startling new interpretation of what really happened in the Rosenberg Case. See also Famous Trials and Can the Rosenberg case be re-opened. 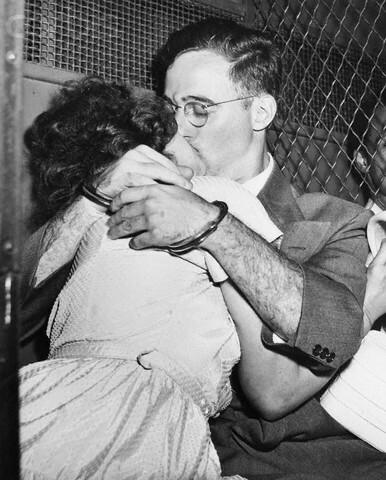 Bound for separate cells, handcuffed Julius Rosenberg and his wife, Ethel, share a fervent kiss in prison van outside Federal Court after arraignment on atomic spy charges in 1950. The couple lost plea to have their bail of $100,000 each reduced and eventually became the only two American civilians to be executed for the crime of espionage during the Cold War.